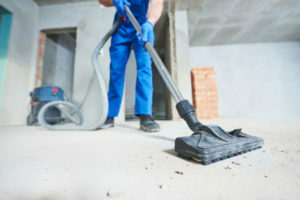 Here at American Flooring Removal, we specialize in advanced techniques designed to remove much of the waste and debris left behind by flooring removal. That’s right, our dust-free tile removal in Grand Prairie, TX, is now easier than ever. We’ll save you money, time, and hassle when installing a new floor. Less mess means a speedier process. When it comes to removing any type of flooring, but with tile especially, the mess is always a primary concern for homeowners. But what if we told you we could remove the mess altogether? That’s right! Using our state-of-the-art system and techniques, we can reduce dust completely. We suction the dust straight from the tile flooring as we lift the old material up. Our tile removal process is quicker and cleaner than ever before. If you or someone you love suffers from breathing problems, you know how overwhelming dust can be when it is in your home. Our dust-free tile removal process is guaranteed to keep your home cleaner during the flooring removal job. You’ll enjoy a clean home, you’ll breathe easier, and you’ll have a brand new floor to enjoy! Grand Prairie, located in Dallas County, is the fifteenth most populous city in the entire state. As such, we have the Verizon Theatre, American Airlines Center, and are within driving distance of everything DFW has to offer! Schedule your very own dust free tile removal in Grand Prairie, TX, with American Flooring Removal. Call now at 469-556-3936! We serve entire Grand Prairie, TX 75050, 75051, 75052, 75053, 75054, 75060, 75104, 75212, 75249, 76002, 76006, 76010, 76018, 76040, 76063, 76065, 76155. Everything went as planned and promised. The end result was far superior to any thing I could have done on my own. Was not too expensive and worth every penny! I wiill never again remove tile and flooring on my own!